Photos from different hash events. Interhash photos start from earliest (18th) to latest (23rd). While the InterHash usually only covers one weekend there are several, and sometimes conflicting, events both before and after the event. These events may even be in a different country than the main event. Nearby hash clubs may wish to take advantage of the visiting hashers and provide them another place to do some interesting running. 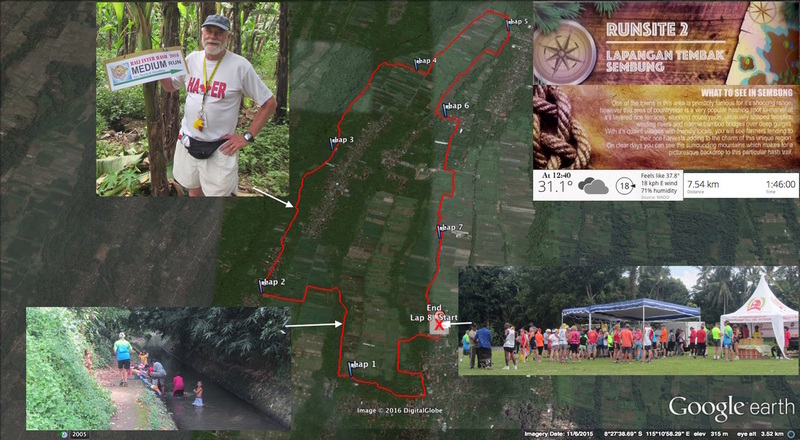 Bali with all of the InterHash2016 trails that I did. The Sad Cow Hash House Harriers group was originally formed by a group of Canadians after the Chiang Mai, Thailand InterHash in 2006. The group travelled to the island of Sai Kaew off the southern coast of Thailand with the idea of relaxing after the main event and having a hash run. The group decided that this should become a dedicated hash kennel and the name Sad Cow, a corruption of Sai Kaew, be adopted. 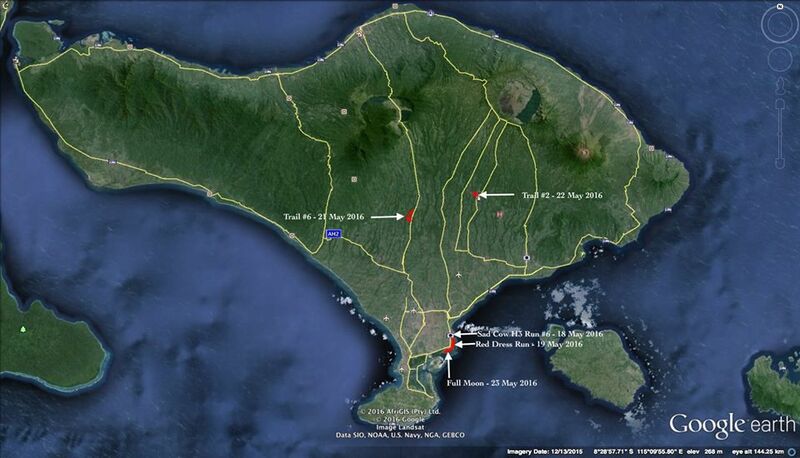 It was also decided that the Sad Cow H3 attempt to host runs pre or post further InterHash events from an island. 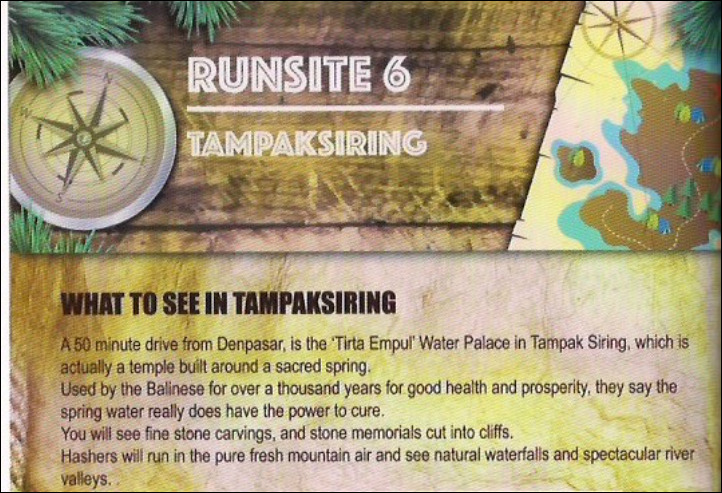 As Bali is an island the run remained on the island. 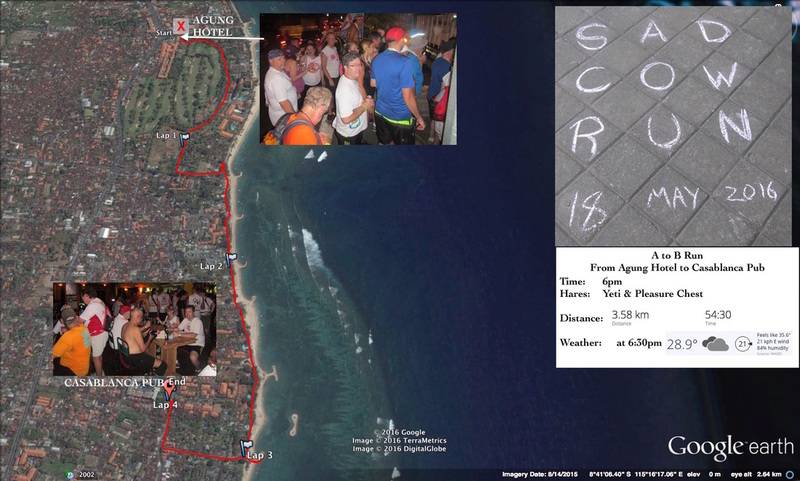 As the event was held late evening there are few photos of the actual 'run' along the beach from the Agung Hotel to the Casablanca Pub in Sanur Beach. Click on the slide show to view the photos. 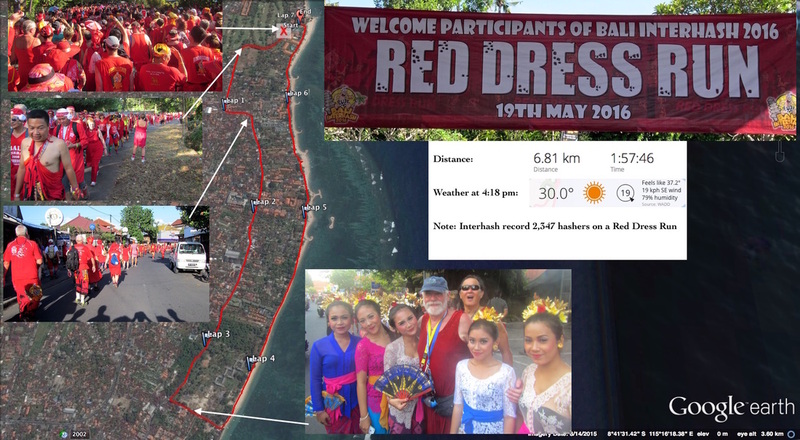 Almost every hash group has a red dress run (RDR) and the InterHash RDR's are a very special event drawing thousands of participants. This year's event set a record of 2,347 paid participants. All red dress runs are always a charity event and the money given to one or more local charities. I managed to complete the medium portion of this trail. But I did not notice and stone memorials cut into cliffs, but did do two water crossings and a trek through a cave/tunnel. We did not get a chance to enter the temple or partake of the healing waters. Maybe when we crossed one of the rivers or at the end when we got to wash some of the mud off in the canal we did get to enjoy the healing waters. 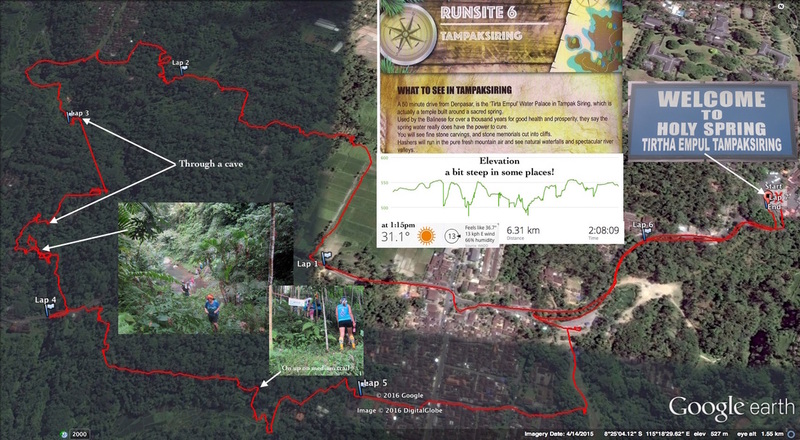 ​What they failed to mention in the run description is the number and steepness of the hills that we would be both climbing and descending, nor the narrow jungle trails. The heat and humidity did not help plus when you were in one of the valleys there was no breeze at all. Check out the elevation chart on the attached map of the run. I think this was the hardest InterHash trail that I have ever done. However, I did get an ego boost at the end from the comments of one young hasher who could not catch me on trail. Plus, I was in line for my second beer when he arrived. Hopefully the photos will show the thickness of the jungle and give some idea of the steepness of the terrain. Thankfully trail number 2 was a much 'calmer' run being about 90% flat through farmers fields and along irrigation canals. After yesterdays trail #6 which was just the opposite 90% up and down steep hills through some very thick jungle. My bruised and blistered feet certainly appreciated the change of pace. If I had been hobbling around on my painful feet I would have completed the trail in a much faster time with more running. That being said I did enjoy the trail and the company along the way. Bangkok Men's Hash House Harriers. A trip nine men made it from Islamabad to hash with the Bangkok Men's Hash House Harriers 24 May 2004.